Thanks to Analog Audio of Minnesota* I now have the privilege of auditioning some amazing audiophile special editions of classic recordings via their monthly new music event. This version of Heavy Weather is my first opportunity to really examine a 45 RPM audiophile presentation. I am new to audiophile reissues. I don’t have enough experience to know how much of the improved sound has to do with great mastering vs. the 45 RPM format. But I know from my youth that 12 inch 45s sounded amazing compared to there confined cousins on the LP (but keep in mind these where typically remixes too – so again was it the 45 format or the mix/master?). I assume the 45 format has a lot to do with great sound – I guess I am showing my hand here – this edition sounds fantastic! 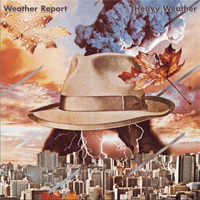 Heavy Weather is a classic in the jazz-rock-fusion genre. Originally released in 1977 it had a certified hit in “Birdland” and next to Joni Mitchel’s Hijira it was key in introducing the innovative bassist Jaco Pastorius to the world. This is a classic Jaco performance. As far as I am concerned Jaco is the Jimi Hendrix of the electric bass. He completely reinvented the instrument. He was a great composer and stunning performer too. But my focus will by on this special edition from ORG vs. a traditional record review. The assumption is that this is a classic album that belongs in any serious music fan’s collection. This is a 180 gram vinyl 45 RPM edition. I has the opportunity to compare this new edition directly to my original near mint vinyl copy on two systems: The state of the art listening gallery at Analog Audio of Minnesota (see description below) and in my modest home set up. I first listened to my original vinyl at Analog Audio and it sounded fantastic – a big upgrade from my home system. Then I switched to the ORG edition and it was immediately different, but was it better? My immediate reaction was that it was less harsh then the original and it was much more open – the instruments literally filled the room in a way that made the original sound almost claustrophobic. Zawinul’s synthesizer was thick and and organic. I realize synthesizer and organic are typically a contradiction, but here you get the feel of horns that Zawinul was mimicking vs. the manufactured electronic sound I have always heard. I have always treated this as a Jaco album and he sounds even better in this presentation. But every instrument is distinct – there is just more space and depth to everything. For kicks we threw on a Master Sound CD edition for comparison, unfortunately it sucked – it was not even a fair fight with my 30-year old vinyl edition, let alone the 45. This edition is not just different – it was better – it was great! I borrowed the album to try on my home set up. I listened to side one of my original vinyl and it did not sound like anything like what I had heard the day before at Analog Audio. It did not sound bad, just compressed and tiny compared to my memory of just one day. I then flipped on the ORG with low expectations. But I was blown away. The difference between the two editions was even more profound on my modest system. It was like an immediate upgrade to my system. My small listen room expanded. Granted it did not match the great room at Analog Audio, but I could buy a lot of audiophile editions over the next several years as a low-cost and incremental upgrade to my system. Just like the day before, there was increased depth and overall spaciousness, but it was much more magnified and obvious. This is not a diminishing the galley at Analog Audio – it is just that on my familiar system the sonic upgrade was magnified magnified to my ears. My conclusion after listening to this edition – was it worth almost $60? Yes, but only if this album is one of your favorites or if money is no option for the best format available. Keep in mind that if you have a decent stereo you can easily buy a near mint used vinyl edition of Heavy Weather for less than $5 and it will sound better than the CD by far. It was a popular album – it is easy to find used. For me, I have a running top-100-albums-of-all-time list, if this edition is typical, I would not hesitate to upgrade my top-100 library with one of these editions. Another consideration is that not everything on your top-100 will be easy/inexpensive to acquire as Heavy Weather, so one of these reissues may be your only real option to get a quality release. Shows how out of touch I am. I didn’t even realize there was such a thing as 45 RPM audiophile pressings. The guy who leant me this album has the best stereo and listening room I have ever experienced. Kinda funny. The first time I heard WR was on my friends fantastic stereo system back in the 70’s. He was Japanese and his dad was plugged into what gave the best sound in the day. Nothing flashy looking just great sound.